The Droid is arguably the phone that put Android on the map, and the sequel to the best-selling Android phone is here, as the Droid 2. The Droid 2 is going to come shipped with Android 2.2, the first device to do so. Aside from Froyo, the Droid 2 has a 3.7" WVGA capacitive touchscreen, 8GB of internal storage, (with support of up to 32Gb on a MicroSD card) a 1GHz TI OMAP processor and 512MB of RAM. There is a also a 3G hotspot option, but like other Verizon phones, you will have to pay $20 a month for this privilege. The Droid 2 also comes pre-installed with Swype, one of the best ways for text-imput on Android Devices. The Droid 2 is going to be available on presale tomorrow August 11th for $199.99, with a R2-D2 Star Wars special edition coming next month. BASKING RIDGE, N.J., and LIBERTYVILLE, Ill., Aug. 10 /PRNewswire/ -- Verizon Wireless, the company with the nation's largest and most reliable wireless 3G network, and Motorola, Inc. (NYSE: MOT), a pioneer in the mobile industry, today announced that DROID™ 2 by Motorola will be available for pre-sale on August 11. Hitting all the right keys, DROID 2 is a feature-packed device that helps manage work and social life with an enhanced QWERTY keyboard, ultra high-speed Web browsing, 3G Mobile HotSpot capabilities, full push corporate e-mail, intuitive social messaging and Adobe® Flash® Player 10.1 for access to the full web – all built on Android 2.2. "When we announced DROID X last month, we reaffirmed our commitment to continue to bring unique Android experiences to the Verizon Wireless network," said Jeffrey Dietel, vice president – wireless device, marketing and development for Verizon Wireless. "The DROID by Motorola was our first Android device, so it is important for us to include the successor to that phone in our portfolio. DROID 2 is not only a continuation of our commitment to Android but offers customers the features and form-factor they crave on the Verizon Wireless network." "With the new DROID 2, we've taken a big leap forward from the original DROID," said Bill Ogle, chief marketing officer of Motorola Mobile Devices and Home Business. "We listened to consumers and are providing an even more robust experience built on Android 2.2 that includes a new keyboard, increased processing power, Adobe Flash Player 10.1 and 3G Mobile HotSpot capabilities to send, access and share information even quicker than before." DROID 2's super-slim design helps customers e-mail, text and tweet with ease. DROID 2 offers a redesigned symmetrical keyboard with raised keys for more responsive typing to push out notes and status updates. Speech-to-text input and the virtual multi-touch keyboard allow for quick messaging; or customers can also use Swype for even easier text input. In addition, full push corporate e-mail delivers enhanced features such as remote wipe and password enforcement so that information remains secure. Customers can also download favorite apps from Android Market™, which has more than 70,000 applications, and store them on 8 GB of preloaded on-board memory and the 8 GB microSD™ card, which can be upgraded to a 32 GB SD card for a total cargo capacity of 40 GB. Popular apps available on DROID 2 include NFL Mobile (downloadable), Skype mobile™ and BLOCKBUSTER On Demand® presented by V CAST Video. Customers can even manage their wireless accounts or their contacts from their phones with My Verizon and with Backup Assistant(SM). "It's great to see amazing new smartphones like the DROID 2 come pre-installed with Flash Player 10.1," said David Wadhwani, senior vice president and general manager, Creative and Interactive Solution Business Unit at Adobe. "With the completely redesigned and hardware accelerated Flash Player 10.1, DROID 2 users will be able to experience the full Web on the go." 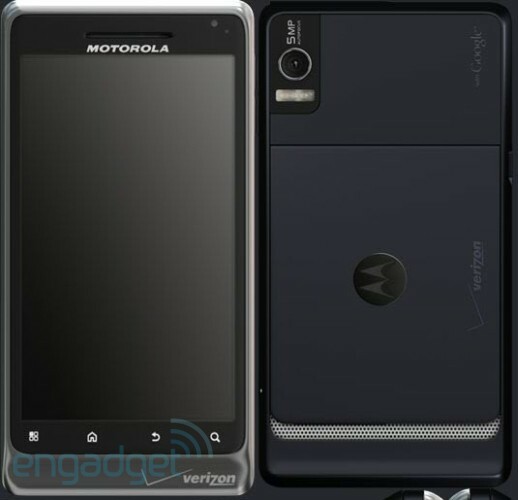 The Droid X has just launched and the sequel to the Motorola Droid, the Droid 2 is just around the corner. 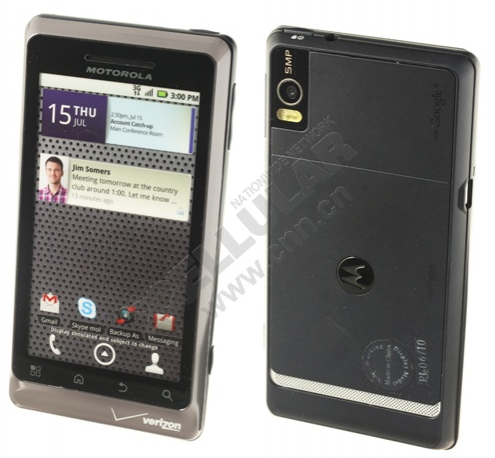 We reported about the Droid 2 being seen in the leaked Verizon catalog (Read here) and now there are some more pictures of the Droid 2. The picture above looks very official and is probably photos that would go in the official. See a bigger version of the photo here. Where as the photo below is probably the dummy phone that you find in stores. This pic also has a the presumed UI of the Droid 2 and the dummy phones can be bought here for $29.99. 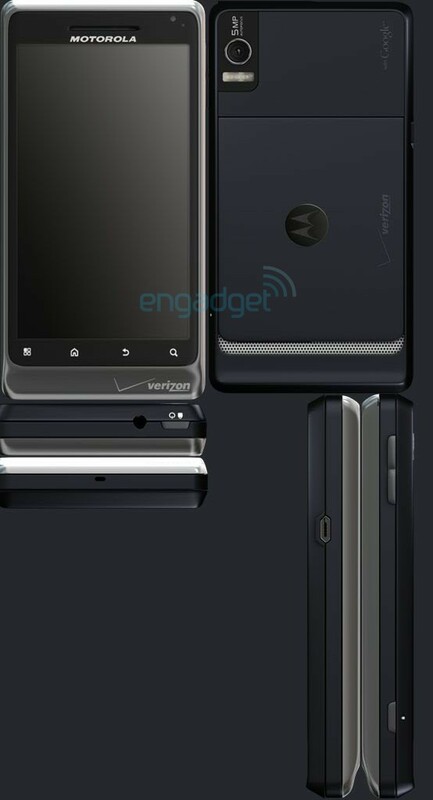 As of yet, Verizon have not officially announced the Droid 2 or a release date but we are hearing a release date of August 23rd. Droid 2 Is Definitely Coming! Verizon has just had their summer catalog leaked by Boy Genius Report. 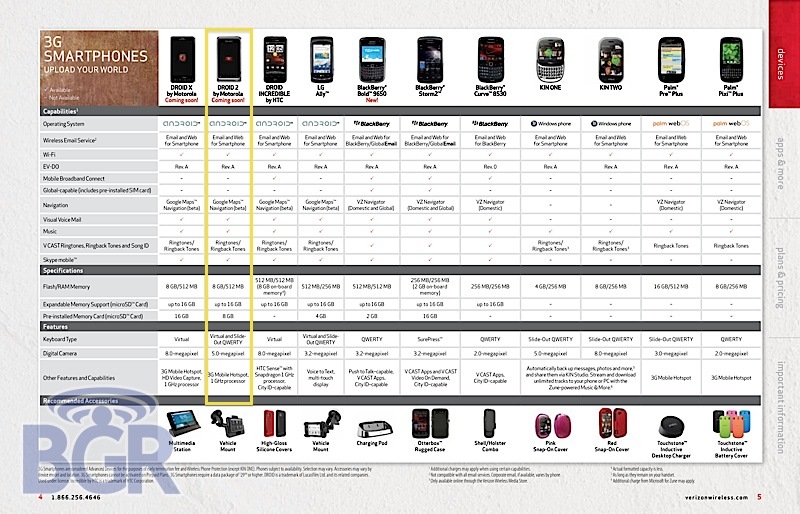 But the most important thing seen in the leaked catalog is the sequel to the Motorola Droid (one of Verizon’s most popular devices), which is called the Droid 2. A device which Verizon has not offically announced. There’s no word on release date yet but ‘coming soon’ has to mean something. Head over to Boy Genius Report to see the full catalog.